Today I'm featuring some new sunglasses from Polette, an eyewear company who offers chic and very affordable prescription glasses. I selected the Eco frames, which have an oversized look without overwhelming my face, and I love the contrasting bamboo arms. Without a prescription they are $18; prescription prices range from $10 to $90. The glasses arrive in a pouch with a microfiber cleaning cloth. Polette can keep prices low by cutting out the intermediaries and selling directly to the customers, and they have a wide variety of looks, ranging from the most classic silhouettes, to bold statement frames. Polette is generously offering one reader of Chic on the Cheap a pair of glasses, with or without a prescription. Just leave a comment with your favorite frames and enter via the Rafflecopter below! Such a cute outfit, love the sunnies too! You probably hear this a lot, but you fancy America Ferrera SO much! Adore that bold dot print and chic sunnies! they sound like such a deal. 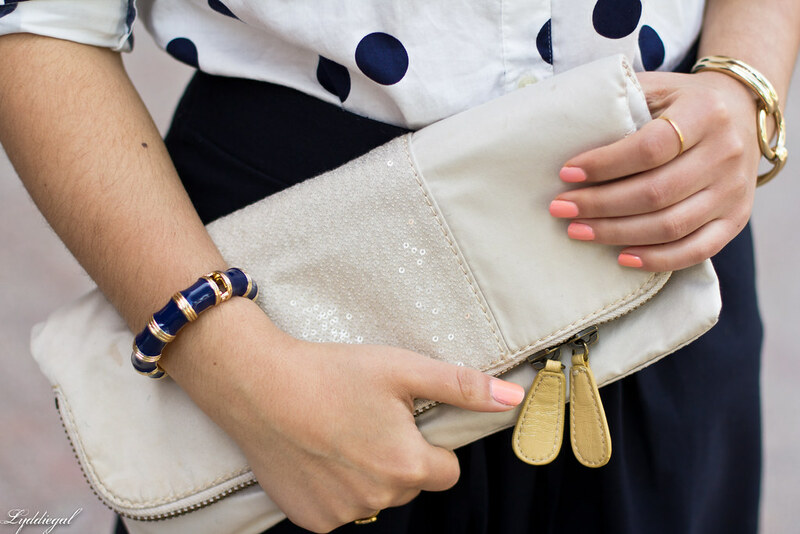 Love this polka dot print and how you paired it with this casual skirt. Perfect Spring look! I say this all the time but I seriously love this outfit. Maybe it's because of the polka dots. Who knows, but I adore it. 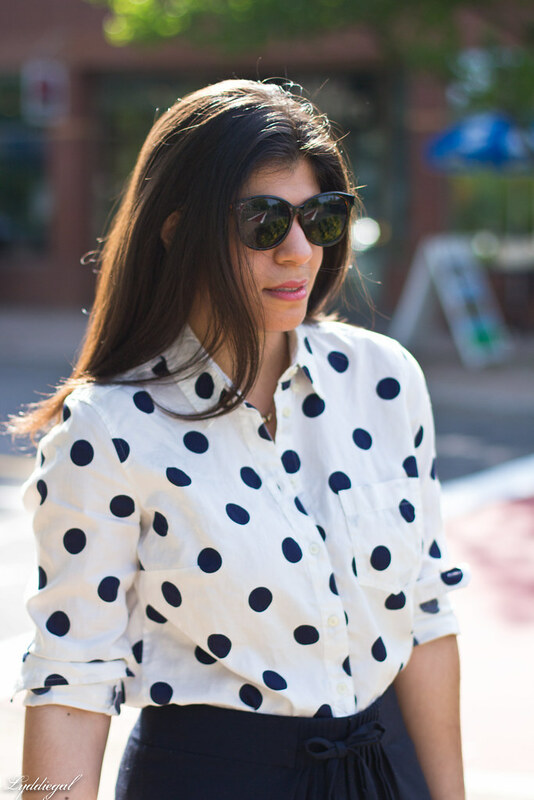 The polka dot blouse is adorable on you! Those frames are sooo cute - I'm glad the contest is open beyond the US! The Stina Bois sunglasses are my favorite - I love tortoiseshell. I would like the Eco. Thanks so much. Fabulous, Lyddie! 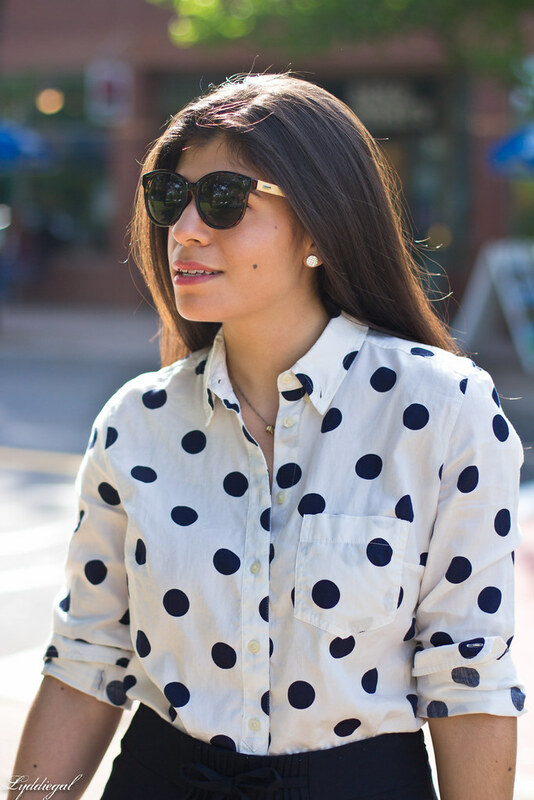 I love the polka dot blouse and your sunnies are really classy and stylish. Essie is my favourite brand, I need to watch out for that colour. I just got a pair of prescription frames from Polette and I'm officially in love. (Which, since I have to wear glasses every day and hate every minute of it, is saying something.) I hadn't really thought much about trying their sunglasses but this pair is fabulour on you - and combined with the polkadot blouse and black skirt there is something distinctly Parisian about the whole ensemble. And what's not to love about that! Love the Ella frames! Cute look. The Winston are fun looking frames! 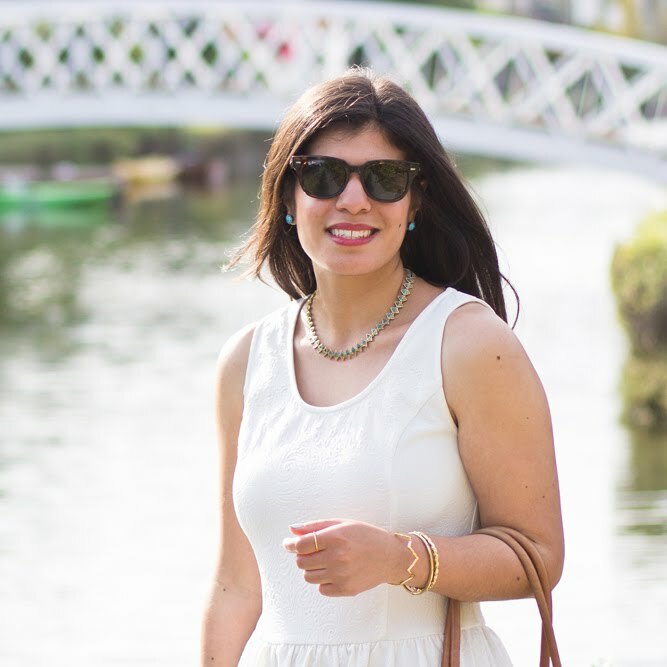 I love my prescription sunglasses, can't live without them! Great top, too! I love the Why Not frames! ive been wanting to get a fun-colored, funky pair of glasses for a while now... i think id choose the Diabolo. or the Manchester. or the Why Not. or the Franklin. I like the On The Way frames! I'd pick the Ella sunglasses! Those sunglasses are so cute! Would love to get me a pair and will probably still grab a pair, even if I don't win the giveaway! Those glasses are so cute! I definitely will have to check this company out! Love the blouse, it's pretty! I'd pick the Eco B. 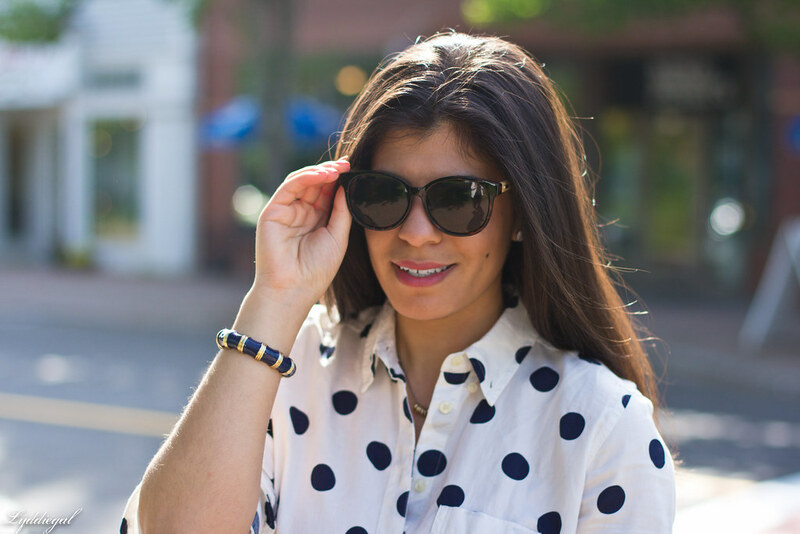 That polka dot shirt is so fun, and I'm loving your sunglasses! Loving the polka dots and those sandals are amazing!! Oh I love the B&W sunnies! So vintage chic! love the Fergamon frame. they're so chic. Those are such a great shape! And I love the contrasting arms too. I think I would go with Winston. Such an amusing name, and a good shape. If I win I would choose the Monroe sunglasses! I am always looking for great sunglasses. The California blues are really cute. Great giveaway dear, the sunglasses are gorgeous!! So cute on you! I'd pick the pilot sunglasses for myself! it's a three way tie between the straight gold, parisenee or the bricks!!! they're all so lovely!! Eco B, or any one of the wooden frames! So chic! My prescription sunglasses changed my life! Sounds like a great option. Let's talk about your outfit though - love it! I would choose the brooklyn frames. I like Verzon, but need sunglasses too. Polka dotty magic! I love those Errikka ones--so sleek! I would get the Long Beach Orange glasses. Thanks! i really love the merlin frames. so cute! I would choose the trendy!